The morphology of the skull of Panthera leo is designed to exert powerful forces at the level of the canines when closing its jaws. The primary jaw-closing muscle, the temporalis, originates on the wide area of the lateral surface of the cranium. Lions often kill large prey such as zebra and wildebeest by strangulation (closing jaws around the throat) or by suffocation (closing jaws around the muzzle). Panthera leo relies heavily on its massive canines and incisors when feeding on muscle and connective tissue, and the skin of the prey is removed from the carcass with short pulls using these anterior teeth. Not surprisingly, the teeth P. leo breaks most often are the canines; the probability of an individual lion breaking a tooth during its lifetime is estimated to be greater than 0.25. This specimen of Panthera leo, an adult, was collected by Tom Larson, Zkukuza, Kruger Park, Transvaal, South Africa in 1948. It was made available to The University of Texas High-Resolution X-ray CT Facility for scanning courtesy of Drs. Blaire Van Valkenburgh and Jessica Theodor, Department of Organismic Biology, Ecology, and Evolution, University of California, Los Angeles. Funding for scanning was provided by Dr. Van Valkenburgh and by a National Science Foundation Digital Libraries Initiative grant to Dr. Timothy Rowe of The University of Texas at Austin. This lion is one of several felid carnivorans included in ongoing research of respiratory turbinates by Drs. Van Valkenburgh and Theodor. The specimen was scanned by Matthew Colbert on 15 December 2000 along the coronal axis for a total of 406 slices, each slice 1.05 mm thick and with an interslice spacing of 1.0 mm. The dataset displayed was reduced for optimal Web delivery from the original, much higher resolution CT data. Johnson, W. E., and S. J. O'Brien. 1997. Phylogenetic reconstruction of the Felidae using 16S rRNA and NADH-5 mitochondrial genes. Journal of Molecular Evolution 44:S98-S116. Kurtén, B. 1968. Pleistocene mammals of Europe. Aldine Publishing Company, Chicago. 317 pp. Kurtén, B., and E. Anderson. 1980. Pleistocene mammals of North America. Columbia University Press, New York. 442 pp. Fischer, K. 1994. 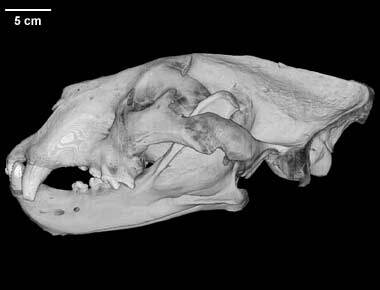 New findings of late Pleistocene cave lions Panthera leo spelaea (Goldfuss, 1810) in Ruebeland (Harz). Braunschweiger Naturkundliche Schriften 4:455-471. Leyhausen, P. 1979. Cat behavior. The predatory and social behavior of domestic and wild cats. Garland STPM Press, New York. 340 pp. Mattern, M. Y., and D. A. McLennan. 2000. Phylogeny and speciation of felids. Cladistics 16:232-253. Merriam, J. C., and C. Stock. 1932. The Felidae of Rancho La Brea. Carnegie Institution of Washington Publication No. 422. 231 pp. + 42 plates. Owen, P. R. 1994. Comparative morphology of the atlas-axis complex in large felids and canids of Rancho La Brea. Unpublished Masters Thesis, California State University, Long Beach. 163 pp. Salles, L. O. 1992. Felid phylogenetics: extant taxa and skull morphology (Felidae, Aeluroidea). American Museum Novitates 3047:1-67. Savage, R. J. G. 1978. Carnivora. Pp. 249-267 in: Evolution of African Mammals. Maglio, V. J., and H. B. S. Cooke, editors. Harvard University Press, Cambridge, Massachusetts. 641 pp. Schaller, G. B. 1972. The Serengeti Lion, a study of predator-prey relations. The University of Chicago Press. 480 pp. Turner, A. 1990. The evolution of the guild of larger terrestrial carnivores during the Plio-Pleistocene in Africa. Geobios (Lyon) 23:349-368. Turner, A. 1997. The big cats and their fossil relatives. Columbia University Press, New York. 234 pp. Van Valkenburgh, B. 1988. Incidence of tooth breakage among large, predatory animals. The American Naturalist 131:291-302. Van Valkenburgh, B. 1996. Feeding behavior in free-ranging, large African carnivores. Journal of Mammalogy 77:240-254. Van Valkenburgh, B., J. Theodor, A. Friscia, and T. Rowe. 2001. Respiratory turbinates of carnivorans revealed by CT scans: a quantitative comparison. Journal of Vertebrate Paleontology 21:110A. To cite this page: Dr. Pamela Owen, 2002, "Panthera leo" (On-line), Digital Morphology. Accessed April 19, 2019 at http://digimorph.org/specimens/Panthera_leo/adult/.